Warning: Prepare for a rant! There is a horrible habit in American restaurants that has been around for decades and Just. Won't. Die: it is to serve undercooked vegetables. How in the world did this get started? It seems to be a holdover from the seventies or something. And it seems that chefs just won't stop doing it. They refuse. And why is that? Because they think that's what people want - they think that the general dining public doesn't know that an undercooked, squeaky green bean, reeking of that raw taste of chlorophyll is not a properly cooked green bean. It needs to stop - and you all need to do your part in this effort. You have to start complaining. I went out to dinner this summer with my youngest son and when his meal showed up, there they were - the green veg accompanying his steak was green beans. I looked over and knew right away. I watched as he took a forkful and tasted them. "Mom, these green beans are raw." Yup. I knew that already. We were at a nice local restaurant where everyone thinks the food is outstanding. And the cook served up raw green beans. I knew they would be that way - unless you go to a restaraunt that actually cares about the food, this is what you will get. Visiting my son at school in Chicago, we went to a well known fine steakhouse. The green veg accompanying my steak? Brussel sprouts. I love brussel sprouts. I was looking forward to a nice serving of them. What did I get? Practically raw sprouts. I know what the chef had done - just blanched them briefly in boiling water so they would retain all their wonderful rawness when they were served. I took one bite and told the waiter as nicely as I could, "These sprouts are still raw. Tell the cook they aren't prepared correctly". The waiter looked stunned. "This is the way most people like them," he said. "Tell him if I wanted to order crudités, I would have been happy, but I ordered a hot, cooked vegetable," I said. So all I can think is that a lot of people just haven't had properly cooked vegetables. 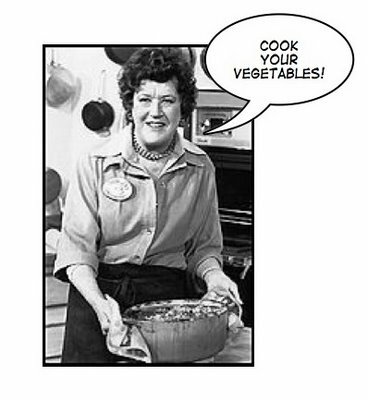 Julia Child was famous for saying that the American way of cooking vegetables just until they are crisp was ridiculous and never brought out the real flavor of the vegetable. She said that the way Americans cooked green beans left a raw, grassy flavor that did nothing for the green bean. She was right. And I'm not talking about cooking your vegetables to deathly mushiness. Just cooking them until any "raw" taste is gone. I guess it's a matter of taste, but the French don't cook vegetables this way and neither do the Italians. In fact, Guilano Bugialli says that the biggest problem in American restaurants is that they undercook the vegetables. Amen! I think it's kind of interesting - you're more likely to get properly cooked vegetables lower down on the dining food chain - a Cracker Barrel at least cooks their vegetables until they're done. It's when you start getting into better dining establishments that they totally jettison any cooking knowledge and succumb to their impression that the general public wants their vegetables this way. As you climb that dining food chain farther up, however, you aren't going to encounter these kinds of undercooked vegetables. You're not going to find that at a Thomas Keller establishment or at Daniel Boulud's restaurants - they don't care what you think, they care that the food is properly cooked and that you will come to understand that. There is a big difference between eating asparagus that has been briefly blanched in boiling water and still has a raw taste to it. And I know a lot of people think that is a the right way to cook asparagus. In fact, cooking the asparagus longer, until the raw taste disappears, brings out the best flavor of the vegetable. Next time you make asparagus, try roasting it in the oven for much longer than you think you should. You will be eating asparagus that has a depth of flavor that you have never had before. And no raw taste at all. So I'm leaving you with a Green Bean with Pesto and Tomatoes recipe and a plea to say something the next time you go out to dinner. I know it's easier to not complain, and I certainly don't like doing it, but chefs need that feedback. For the proper way to cook green beans, I defer to Mr. Thomas Keller, master of all things culinary and an abosolute perfectionist. He insists on what he calls "big pot blanching". He fills a large pot with well salted water - more salty than you would think - he uses a cup of kosher salt in a gallon of water! I don't use that much - just a couple of tablespoons. Then he cooks his green beans until they have no raw taste left. If you want to serve them at room temperature, plunge them in ice water to stop the cooking, which is what I have done in this recipe. This dish is served at room temperature. Add the 2 Tablespoons of salt to a large pot of water and bring to a boil. Prepare an ice bath by placing lots of ice cubes in a very large bowl of water. Plunge the green beans into the boiling water and cook until just tender and there is no raw taste left. Depending on how big your beans are and how fresh, etc., this can take anywhere from about 5 - 8 minutes. Just keep testing a bean until they are done. Remove the beans (I like using a spider like this one) and plunge into the ice water. Meanwhile, prepare the pesto - in a food processor, pulse the garlic, cheese and ½ teaspoon black pepper together until finely ground. Add the basil leaves and pulse. Add 3 tablespoons of the olive oil and pulse. Prepare the tomatoes by tossing the tomato halves with the remaining tablespoon of olive oil and ¼ teaspoon of the black pepper. Add a pinch or two of salt and set aside. Remove the green beans from the ice bath when they have cooled off (this only takes a few minutes) and lay them on paper towels to dry. A good way to do this is to use Thomas Keller's method - he places a rack over a baking sheet, lined the rack with paper towels and drains the beans on the towels. The excess water drips through and down onto the pan so that the beans won't be sitting in water. Pat the beans dry. Dump the ice water from the large bowl, wipe dry and place the beans in the bowl. Make sure the pesto is loose enough to dress the beans - if not, add a little more olive oil. Toss the beans thoroughly with the pesto, using your fingers to lightly toss them. Taste for salt and add a little, if needed. Place the beans on a large serving platter. Add the marinated tomatoes on top and garnish with additional fresh basil leaves. Serve at room temperature. AND HERE I THOUGHT I WAS THE ONLY ONE WHO FELT THAT WAY!!! Thank you thank you for this post. I agree completely. If I wanted a raw vegetable, I'd order one. Green beans should not be crisp. They should be COOKED. Same with broccoli! Cook those veggies people!!! Bravo Elaine!!!!!! Your presentation is beautiful! Another important lesson is that people eat with their eyes before even tasting the dish. Food needs to be appealing. Elaine, I'm thankful for all of your great efforts with this blog.